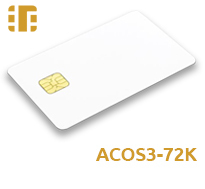 The ACOS3-72 card from ACS is a flexible microprocessor smart card with 72K bytes of EEPROM memory. Backward compatible with all earlier ACOS2 and ACOS3 cards, it supports 3-volt operation and PPS speed negotiation. The high degree of security enabled by this card allows users to consider high-end payment applications, especially when used alongside the ACOS6 Security Authentication Module (SAM).